Well, in timespace we don’t deal so much with “circles” per se. We get more of these these weird shell-type constructs. But the connection is the same. Thanks to some big news that will hopefully come next week… I feel I can safely say that this project is reaching closure. Years ago when I began chronicling the 95ers indie film adventures in this blog, I wrote about some of the core mysteries and struggles—and grand misconceptions—we were facing. A reprint seems very appropriate now. Enjoy! When people ask me about my movie, what they usually ask is something like: “So how do you get it out there?” Or in other words, how does a nobody get their movie in theaters or on TV or at least on DVD? In fundraising, the most typical question seems to have been: “Do you have distribution?” And in fact, when I first embarked on this journey, that was the biggest obstacle in my own mind—getting it seen. Little did I know that was the least of my worries. For most of the people I’ve met, filmmaker or no, the great and mystical gate in filmmaking where success is on one side and failure is on the other is the gate of “getting it seen.” Also known as “distribution” or “getting picked up.” This is the point at which a giant creative blob that seems to be only an eccentric hobby, suddenly becomes something useful and worthwhile. It is creativity legitimized. I was fully steeped in this fallacy. The truth is, as any artist whose creative aspirations have been in the emergency room for most of their existential existences will tell you, the distributor’s gateway is absolutely not the plague an artist needs to worry about. Most indie movies die horrible deaths long before the question “So how do we get it out there?” is ever seriously addressed. In fact, I would hazard to say that a careful autopsy of 99.99% of indie ventures would reveal that distribution problems had nothing to do with their demise. Perhaps the fear of non-distribution plays a role, but rarely non-distribution itself. And here’s why: INDIE MOVIES HARDLY EVER GET FINISHED. 1) Too many great ideas. The filmmaker has so many great stories in his head, he or she just can’t settle on one long enough to write a script. These movies die young. 2) The script never gets finished. The filmmaker realizes the entire script needs to be re-written, and the task is so daunting he throws down his scalpel and leaves the patient dying on the table. 3) The money runs out. The rich uncle’s blood type is actually not O-negative (universal), meaning he just doesn’t invest in ‘anything,’ and the filmmaker himself only gets $60 a pint when he donates. The filmmaker looks down at his instruments and his patient and is struck by a sudden fear—what am I doing here?? He is convinced (by himself and/or others) that his lack of training or talent will only lead the project to disaster! 6) The man behind the doctor’s mask. The filmmaker is actually a charlatan who has no idea what he’s doing (which in and of itself is not a true reason for failure), and is too dumb or lacks the integrity to fess up. The fair promises and blustering used to get people on board or string them along eventually reveal themselves and soon everyone is driven crazy, and eventually everyone is driven away, leaving the filmmaker to his own faulty devices and pitiful excuses. 7) The creative team dissolves. It’s right during the catastrophic organ failure at some stage of the production process that one of the doctors on the elite team realizes he or she hemorrhaging themselves. 8 ) Will to live. The filmmaker has called the ambulance so many times, and has been in the ICU overlooking the comatose movie venture for so long, he’s forgotten what makes the thing worth saving in the first place. He begins to search for enough reasons and tries to find enough consolation, to pull the plug. Indie movies don’t fail because they don’t get picked up for distribution. For the most part, if they fail, it’s because they don’t get finished. Over the last few years, I have had the great displeasure of spending thousands of hours creating many of the visual effects for the movie… There is a ludicrous amount of compositing, greenscreening, and fancy particle effects, etc. throughout the movie, payment for which was required in SILVER. Silver hairs. Our awesome miniatures and cool sci-fi sets were of course created by Hollywood veteran and time machine engineer/puppeteer Clark Schaffer. Clark and I are huge fans of traditional in-camera VFX with miniatures, sets, and cinematic trickery of all sorts, a la the original Star Wars movies. But lurking in the back of my mind throughout all this time were a couple of final shots… Shots that had haunted me ever since I did that darn rewrite on the script. 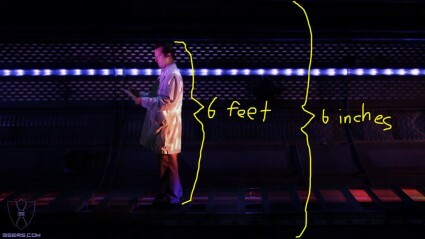 Shots that would be way too expensive to do as miniatures and with motion control. But shots that I HAD TO HAVE nonetheless! Shots that would add production value, tell critical parts of the story, boost sci-fi “epicness”, and help sell the movie. I needed a 3D matte painting, something outside of my realm. I searched and searched, deep into the portfoliac recesses of the web, and finally found a teacher-turned-VFX-guy from Poland living in Shanghai!!! Please welcome Adam Kuczek to the 95ers VFX team! Frankly, Adam has been a delight to work with. Not only is he a fantastic talent, he also has a strong sense of visual cinematic storytelling. I can’t show you the shots he’s done for us yet… but in the upcoming “95ers official trailer 2,” due in about two weeks, you’ll see a glimpse them. Until then, explore his site and enjoy his reel. Spaceships in a time travel movie? Very few people, even in the Chronos Protectorate, know much about the “spaceship” component in 95ers. And at long last, even as I go into meetings with distributors (in fact I have one tomorrow), the final visual effects shots are being completed. And one of them includes SPACESHIPS! The grand story arc of 95ers includes pitched battles in space as well as aerial dogfights much more akin to Star Wars than Top Gun. 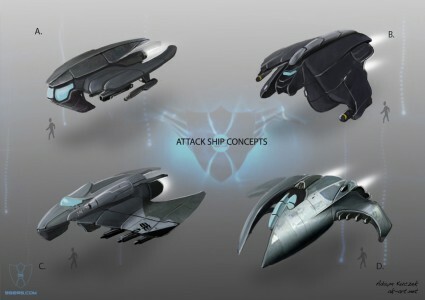 Over the years various awesome artists have been creating ship concepts for the 95ers Universe. And in a matter of days, you’ll see one of them come to life in the updated movie trailer. Here are some early concepts. Most of this work was developed for what is planned to be the third movie in the 95ers franchise. 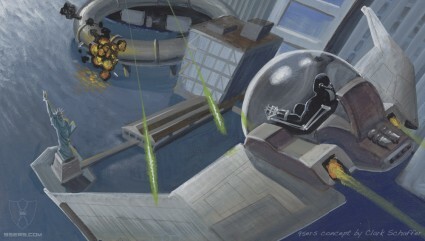 Here’s a cool full color piece of concept art by the amazing Clark Schaffer. And here’s one of my favorite early concept pieces, by Justin Kunz. You can see teeny tiny ships in the distance. This mega-cool poster concept for a future 95ers project also shows a glimpse of ships (including an old Spanish galleon…). Get an email when something cool happens and when there's an opportunity to get involved!